If you watch just one episode of Shooting USA TV this year, it should probably be this week’s hour-long SHOT Show Special. Tonight, March 1, 2017, enjoy a full hour of SHOT Show coverage. Jim Scoutten’s team of gun journalists work hard every January, bringing you highlights from the gun industry’s largest trade show. Jim, son John Scoutten, and other staffers prowled the 12 miles of aisles in the Sands Convention Center in Las Vegas, visiting many of the 1,600+ exhibitors. This episode provides a “first look” at the new guns, optics, and gear introduced for 2017. Click HERE to learn more about this week’s SHOT Show episode. 2017 SHOT Show Highlights: Savage MSR Rifles, GA Precision Tempest Action, Smith & Wesson M&P 10 in 6.5 Creedmoor, Colt double-action Cobra, STI Match pistols and a whole lot more. Shooting USA’s SHOT Show Special will air for a full hour on Wednesday, March 1, 2016 on the Outdoor Channel. Here are the air times, but you should check your local schedule. Look for Shooting USA TV on the Outdoor Channel. 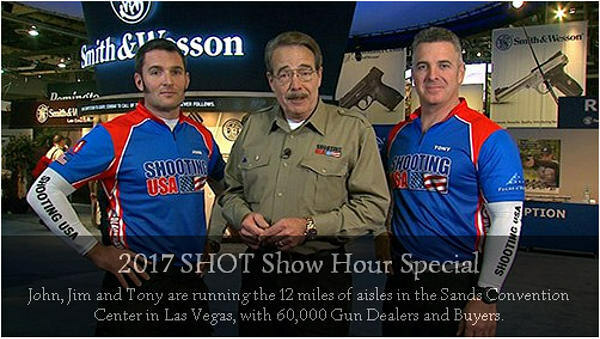 Share the post "SHOT Show 2017 Special on Shooting USA TV Tonight"